« EXCITING PROJECT > The MOSAIC BAYSWATER White Brick Apartments in Vancouver Kitsilano Real Estate Market > Boutique Kits BAYSWATER Vancouver Condos Now Previewing > 31 Opportunities Only! One of the BEST townhouse communities in 2012! WE LOVE Polygon’s latest addition to the River District community in addition to everything about it including the architecture, modern interiors, layouts and location. Located in the newest Vancouver waterfront real estate district called River District, the new River Walk Vancouver townhomes are the latest release in Polygon’s master planned riverfront community. This is the first executive townhouse development and it’s called Vancouver River Walk River District townhomes where you will find an amenity rich, pedestrian and family friendly neighbourhood on the south shores of Vancouver waterfront real estate. From brand new retail, boutique stores, cafes, shopping, dining and green spaces/boardwalks, the River District River Walk Vancouver townhomes will become a part of this exciting new community that has garnered lots of media attention and awards for eco-friendly design. The riverfront community of River District Vancouver River Walk townhomes will be a limited collection of executive townhouses and will have modern West Coast architecture with a striking ‘saw tooth’ roofline, natural fir wood detailing, brick façade detailing and ground level entries for added convenience. The new River District River Walk Vancouver townhomes will also have three or four bedrooms inside, which is geared towards couples and growing families as well as downsizers looking to sell their single family home and move into a brand new executive riverfront townhouse in the master planned River District Vancouver waterfront real estate community. Inside, you will also find high end Bosch appliances in stainless steel and paneled finishing in addition to engineered stone quartz counters in the kitchen. The presales for the new South Vancouver real estate River Walk Townhomes project is projected to start on Saturday, April 14th at noon sharp. Please contact Polygon River Walk Homes Ltd. today for more information or you can visit www.polyhomes.com today. You can also register with us for more information as it becomes available. If you do not currently have a realtor (i.e. not represented), we can help find a suitable agent to provide you professional services for the River District River Walk Vancouver Townhomes. Just featured in Metro Places is the spectacular new Vancouver River Walk Townhouse project which features distinctive West Coast modern architecture. It’s really the best example of true ‘West Coast modern architecture’ that we’ve seen and they are simply beautiful. 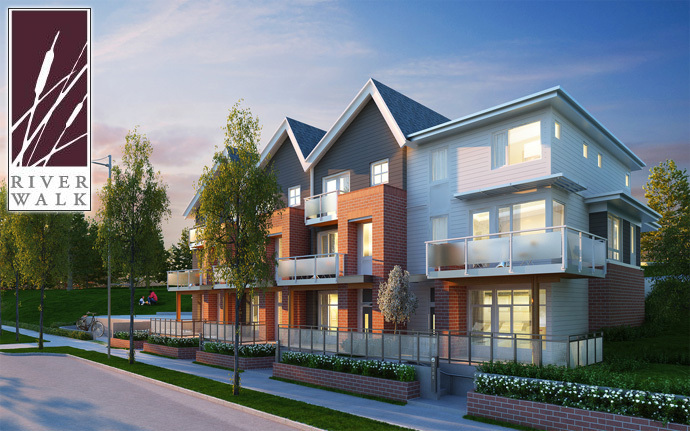 Located at 3179 East Kent Avenue Vancouver at the south end of Kerr Street and along the Fraser River, the River District River Walk Townhomes features 3 and 4 bedroom multi-level, townhouse style living from 1292 square feet to more than 2,000 square feet in size. Ideal for couples and families of all sizes, the West Coast modern architecture is clearly designer and customized for this project by Polygon, our favourite developer. Not only is Polygon’s customer service outstanding, but their offerings are always what homebuyers want. The Vancouver River District community is a master planned neighbourhood along the banks of the Fraser River in South Vancouver and the introduction of the River Walk Townhomes makes it even more appealing. Now, not only do you have low and mid-rise condominiums but you also have multi-level family oriented townhouses at River Walk. The price ranges from $638,000 to the high $800,000s depending on size and location within the community and there are only 77 opportunities for immediate occupancy (which is also great, as interest mortgage rates are so low). You can get more online at riverdistrict.ca or polyhomes.com today. Along the north bank of the Fraser River, the new Vancouver River Walk townhomes presents West Coast modern architecture with the use of rich woods, metal, stone and glass. The distinctive saw-tooth rooflines is very attractive and presents great curb appeal. Also, the new Polygon River Walk Vancouver townhomes are built to Built Green Gold standards along with the West Coast modern architecture, which again, makes it more appealing to homebuyers than any other location or product on the market right now. Highly efficient and very elegant, the homes have a juxtapose of dark and light colours, smooth and rough materials as well as truly modern interior finishes that include Fisher & Paykel and Bosch appliances. 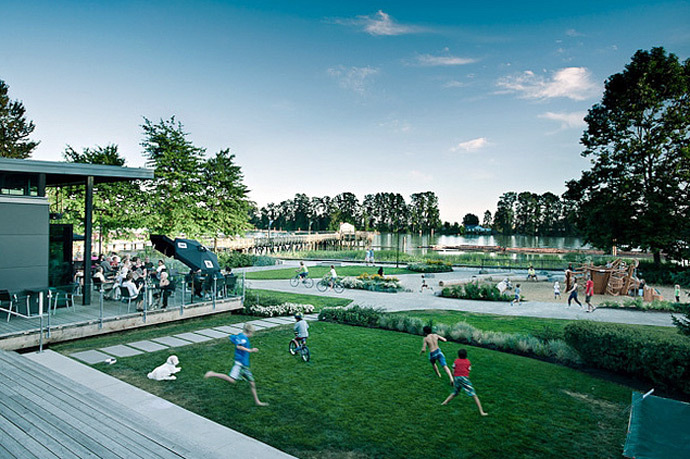 The master planned neighbourhood also presents the Vancouver River Walk Park and green space that is also surrounded by lots of walking trails. Nearby, there is Champlain Heights shopping and a soon to open grocery store. The Canada Line Skytrain station is also very close by. Located on the southern banks of the beautiful Fraser River in South Vancouver real estate district, the new Vancouver River Walk Townhouses by Polygon Realty is one of the BEST projects of 2012. Situated at Kerr Street and Kent Avenue SE Vancouver, the new River Walk Townhouses are located within the Polygon master planned River District community which saw the launch of the New Water Condos last year. The new riverview River Walk Vancouver townhouses will be the second neighbourhood release in this prestigious new development and will feature attached townhome style living that is catered towards couples and families. Also, both upsizers and downsizers will find that the new South Vancouver River Walk Townhouses at River Walk District will be ideally sized and functional for their needs and requirements. The water view homes at the River Walk Vancouver Townhouses are set to launch in Spring 2012 and will be just steps from the Fraser River shoreline. The executive homes at River District Vancouver will also offer residents all the perks that the New Water condo home owners get, the close proximity to new shops, restaurants, retail stores, big box retailers, the boardwalk, pier and all the natural green spaces surrounding the community. In addition, the River District Vancouver community where the new water view River Walk Townhouses are located will also be very close to a brand new school (great for families) and all of the river front amenities and water sports that come along with the locale. The architecture itself is very unique, though modern West Coast. It’s slanted saw-tooth rooflines are very attractive and the architectural detailing is magnificent. We’re unsure about who the architect is, but the new Vancouver River Walk Townhouses will certainly add a great design to the community. There are brick facades, warm natural fir highlights and garden patios as well. The designs are truly modern. Inside, home buyers can decide on 3 or 4 bedroom floor plans at River District River Walk Townhomes where you will find beautiful open concept spaces, bright living rooms, window shades, large kitchens with gourmet appliances/stone counters and bathrooms that will soothe your soul. The bedrooms will be carpeted and will be oversized as well. The River Walk Townhomes in Vancouver River District will also have parking and in suite storage in addition to beautiful hardwood floors. The appliances appear to be by Bosch. All homes should also have in suite laundry closets. The Polygon River Walk Vancouver townhomes will also come with the standard home warranty for your security. Definitely a top Vancouver townhouse development for 2012, we just love this project and the developer, Polygon. The West Coast modern architecture using the ‘saw-tooth’ design is by award winning Raymond Letkeman Architects, another wise choice by leading developer Polygon. The River Walk Vancouver Townhouses at River District will feature attractive brick walls in key locations, tandem or side by side garages (for 2 vehicles) for each home as well as a an amazing outdoor space. Part of the Polygon mandate is to build environmentally friendly homes that are generational, sustainable and low maintenance. The new Vancouver River Walk townhouses will feature BuiltGreen Rating GOLD standards that include CRI Green Label carpeting in the bedrooms, Energy Star rated appliances, water based, low VOC interior paints, laminate floors that are made from one hundred per cent recycled materials, GWB walls that have up to fifteen per cent recycled materials, R40 Batt insulation with 40% recycled materials, built in roll out recycling bin station in every home as well as a car share program on site. We have yet to find a comparable development in Vancouver that is so eco conscious and has gone to such great efforts to protect the environment and to create living spaces that are healthier for its residents. Great job Polygon! A list of draft features has been released to VIP registrants that detail the interior features of the boutique Vancouver River Walk Townhomes. All of the homes will have low-e glass windows, 2 professionally selected interior colour schemes for homebuyers to choose from in addition to nine foot ceilings in most living spaces on the main level. The boutique Vancouver River Walk Townhomes for sale at River District community in South Vancouver will also feature a modern entrance and modern entry way, rich laminate floors and plush 35 ounce CRI Green Label nylon carpets. The spa inspired bathrooms are truly magnificent. The River District Townhomes at River Walk Vancouver will feature master ensuites with wall sconce lights, large vanity mirror, large format porcelain tiled floors, dual flush water conserving toilets, glass tiled accents, bath/shower combo in some floor plans, luxurious soaker tub or shower with rain shower head as well. The main bathrooms at the boutique Vancouver River Walk Townhomes at River District waterfront community will also feature dual flush toilets, vanity lights, porcelain sinks, glass tiled accents and ceramic tiled surrounds for the soaker tub. Some of the homes at the boutique River District Townhomes will have main floor powder rooms with high-end finishes as well. The gourmet kitchens will have sleek, stainless steel appliance set that includes Fisher & Paykel fridge, Bosch dish washer, Bosch electric self cleaning wall oven/gas cooktop and stacked washer/dryer by Whirlpool. The boutique Vancouver River Walk Townhomes at River District waterfront community will also feature double stainless steel sinks that are under mounted, built in recycling bins, halogen task lights, kitchen storage (lots of it! ), islands in some plans and polished quartz counters. What we love about this development is the fact that they are true multi-level townhomes in a master planned River District waterfront community by an established and leading developer in Polygon. The floor plans and site plan are well thought out to give everyone lots of space and breathing room in addition to layouts that allow you to grow into. There are 4 series of floor plans at River Walk Vancouver Townhome project that includes 3 and 4 bedroom, which is ideal for families as well as couples. The townhomes at River District Vancouver are located and bound by 3 streets that include: Pierview Crescent, East Kent Avenue North and Kerr Street. Most of the buildings at the River District townhome community of River Walk Vancouver have 4 to 7 townhouses, with a few that have 3 (triplex) or 8 units. The draft A Plan is 3 bedrooms and 2.5 bathrooms at approximately 1388 square feet. The lower floor has a tandem 2 car garage with a store room, main floor has a deck plus patio (on opposite sides of the floorplate), living, dining and L shaped kitchen in addition to a convenient powder room. The upper floor has 3 bedrooms and 2 full bathrooms, as well as the laundry closet. The waterfront Vancouver River Walk Townhomes Plan B (draft) is also 3 bedrooms and 2.5 baths but is slightly smaller at 1,377 square feet (approximate). If we were in the market to purchase a new Vancouver townhomes, Plan B4 (draft) would be certainly our choice! It’s just awesome. Well designed by Polygon in every way, this 3 bed and 2.5 bath unit will have approximately 1400 square feet of living space. The upper floor has the 3 bed/2 bath setup with laundry closet while the lower floor has a large garage for 2 cars and plenty of storage. The main level is a flow through layout which has the wall kitchen with kitchen island in the centre of the layout. On either side is the living and dining space plus a powder room.